NGC 6188 is an emission nebula located about 4,000 light years away in the constellation Ara (Latin: "The Altar"). It has a radius about 300 light-years. 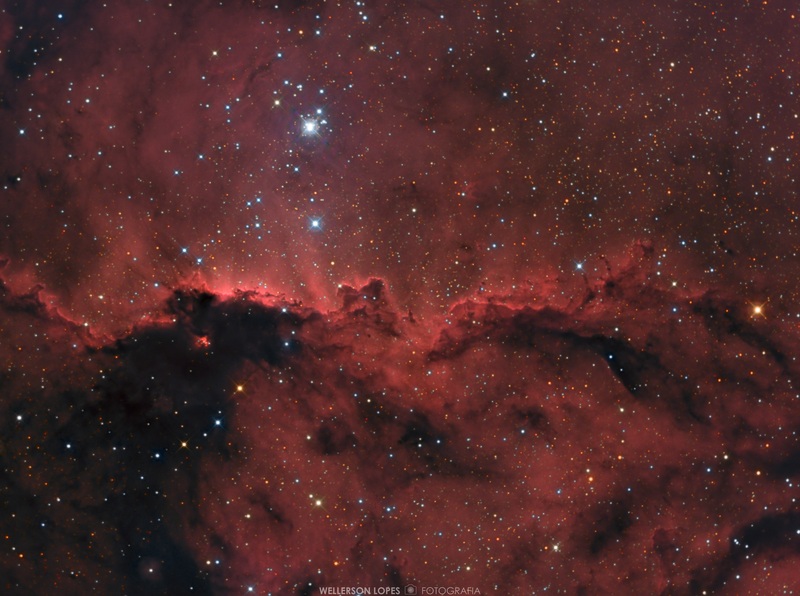 The bright open cluster NGC 6193, at the top of image, visible to the naked eye, is responsible for a region of reflection nebulosity within NGC 6188. The nebula is nominated by many astrophotographers as Ara's Dragons because of the shape of the nebulosity at the center. NGC 6188 is a star forming nebula, and is sculpted by the massive, young stars that have recently formed there – some are only a few million years old. This spark of formation was probably caused when the last batch of stars went supernova. NGC 6193 is open cluster containing 27 stars, visible to the unaided eye. NGC 6193 lies at the center of the Ara OB1 association, which extends over a square degree. The cluster is associated with (and provides the energizing radiation for) neighboring regions of the nebulosity NGC 6188. The brighter star in the image is indeed a multiple star system dominated by two O class system. The star HD 150136 is a triple system while HD 150135 star is a binary system. HD 150136 has an apparent magnitude of 5.54 and HD 150135 has 6.89. Gain: 0, Offset: 10, camera's temperature: -15°C, 5h05m of exposition, darks, flats and bias applied. The luminance channel was composed by H-Alpha narrowband. The Red channel was composed by Red and H-Alpha.